DNS reconnaissance is part of the information gathering stage on a penetration test engagement.When a penetration tester is performing a DNS reconnaissance is trying to obtain as much as information as he can regarding the DNS servers and their records.The information that can be gathered it can disclose the network infrastructure of the company without alerting the IDS/IPS.This is due that most of the organizations are not monitoring their DNS server traffic and those that do they only monitor the zone transfers attempts. 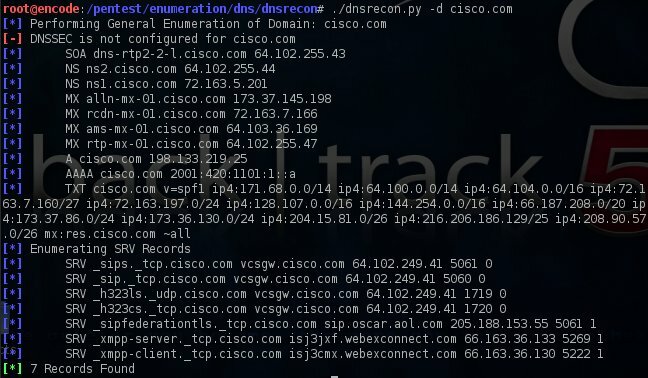 On the web there are a variety of tools available that can gather DNS information effectively but in this article we will focus on the DNSRecon which is a tool that was developed by Carlos Perez and it is designed to perform DNS reconnaissance.This tool is included on backtrack and it is written in python. In order to perform standard DNS enumeration with the DNSRecon the command that we have to use is the ./dnsrecon.py -d <domain>.So let’s try that command against the domain cisco.com to see what kind of information can we retrieve. From the image above we can see that Cisco is not using DNSSec,we discover the SOA record,the mail servers,the IP ranges that the company is using and what servers can send emails (SPF) and of course we enumerated the SRV (Service) records.But what the SRV records tell us?First of all they tell us that Cisco is using VoIP.We understand that because we can see the SIP protocol in use.Also we know that they are using a jabber (XMPP) and videoconferencing in their infrastructure.We also obtained the IP and the ports that these services are running. must be used.Also reverse lookup can be performed against all ranges in SPF records with the command ./dnsrecon.py -d <domain> -s.In the next image you can see the output that produces a reverse lookup in a range of IP addresses. As we can see we obtained A and CNAME records of the domain cnn.com and their IP addresses. As we saw in this article the amount of information that can be discovered during DNS reconnaissance is huge.Often misconfigurations on the DNS servers of our client can help us to map the entire network.DNS reconnaissance is an important step that cannot be missed during network infrastructure penetration tests and DNSRecon can help us to enumerate DNS information.